Kobe city is on Osaka Bay in central Japan. The scenic harbor and mountains offer sweeping views across Japan. The most famous mountain in Kobe is Mount Rokko. You can take on the challenge of hiking or take a leisurely cable car ride up to the observatory. At night, you can see views of the city from the top of Mount Rokko. 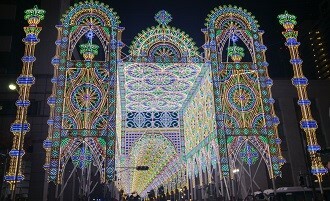 In the winter, Kobe has a festival of lights. The festival has thousands of lights of different colors and is said to represent the life of the people who died in the Hanshin earthquake in 1995. This bright memorial happens every December. Kobe is known world-wide for its marbled beef. The fat in Kobe makes it tender and juicy—a high commodity amongst tourists and locals alike. Besides the beef, Kobe is also known for sobameshi, which is fried rice and fried noodles mixed together. What have you found interesting that you were not expecting to find? All around my city small temples and shrines can be found mixed-in with regular homes and modern apartments. Walking around is always an exciting new experience because of this combination of traditional and modern elements. My apartment is much larger than I had originally expected it would be. I have a balcony large enough for several chairs and a small table, a loft area that provides a comfortable sleeping environment or ample storage space, two decently-sized built-in closets, a spacious living room, a kitchen that allows for the preparation of decent meals, and a bathroom complete with separate toilet, shower, and bathtub facilities. What kind of ongoing trainings have you attended? How have they helped you improve as a teacher? Since the initial training period, I have attended additional specialized training sessions. Their scope has ranged from the finer details of preschool and elementary school lessons to making my teaching more effective in the most popular adult lessons to methods for improving lesson quality for fluent and nearly-fluent students. These trainings have facilitated my ability to teach a wide range of lessons successfully and entertainingly.